Here we offer the greater Pasadena community exceptionally high-quality dentistry. We emphasize the patient’s needs with our holistic approach to oral health care. Vincent Spero, DDS, and Farrah Koutchek, DDS, are our experienced dentists. Our team is unique in our wholehearted dedication to the health of our patients. With our varied suite of services and personable staff, we ensure each patient receives the care they need to smile with confidence. 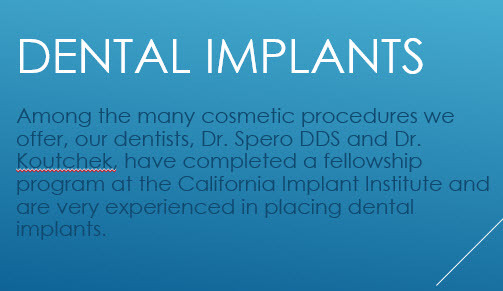 Patients from all over Pasadena visit Dr. Spero and Dr. Koutchek for their excellent cosmetic services. Our team at Pasadena Smiles is very experienced in the design, placement, and preparation of dental anatomy. These skills are combined with our artistic aptitude to help us achieve beautiful cosmetic results. Sometimes the best results will come from a combination of services, and we can guide you through that process to create a plan that works for you, and your budget. We offer dental implant-supported restorations to help our patients regain a sense of permanence after tooth loss. Dental implants are the only tooth replacement option that replaces a whole tooth from root to crown. Dental implant posts act as a surrogate tooth root and preserve the integrity of the jaw bone. Dental implants can support crowns, bridges, dentures, or a full arch of teeth. Drs. Spero and Koutchek are equipped and experienced to help you achieve your very best smile. Our team is committed to the comfort and satisfaction of each patient. With regular care from our team, you and your family can achieve excellent oral health.